Located in North Vancouver. This mountain is a familiar landmark to anyone landing in Vancouver, and at night the lights from the illuminated ski runs mark the sky. It is set up primarily as a tourist attraction, with a large restaurant at the top, as well as a fenced in area with two grizzly bears. It has a downhill ski area and a rink. From Grouse Mountain, there is one main hiking trail which goes north, first of all to Dam Mountain, then Crown Mountain and the Camel. Unfortunately, they also have continuous helicopter tours which often buzz the area north of Grouse every 3 minutes, and thus deprive people of the quiet and solitude that would otherwise be possible. 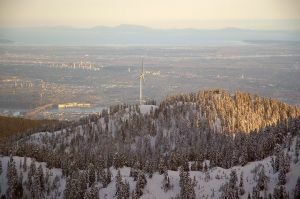 Grouse Mountain can be accessed via a gondola, or via hiking trails from the large parking area at its base. The most heavily used hiking trail is called the "Grouse Grind", and is a popular exercise climb used by hundreds of people every day. Name Notes: Like a half dozen other peaks, this one is named for the Grouse, a hen like bird whose distinctive "whump-whump-whump" mating call characterizes the coast range in spring.